Before I start i would like to apologize. I don't know how to reorganize pictures with the new tapatalk update. I purchased the xtron PB7646BAP about 2 weeks ago and it's in my daily m3 so I figured it's time for a review. 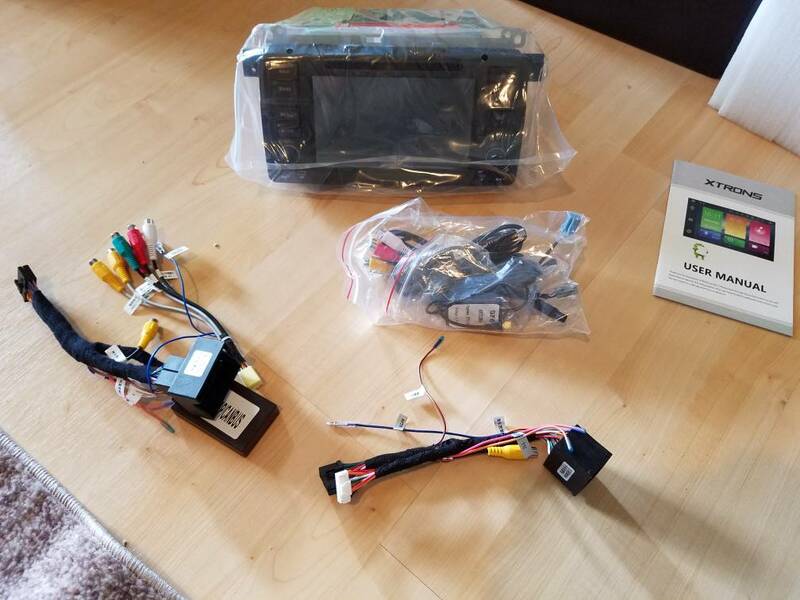 Here's a link to this head unit. The system is very fast. Boot up is fast. Only a few seconds when you power on be able to do what you want. Touch screen is super responsive. All the buttons feel comfortable when you push them. The system is loud! If you do a quick read of the user manual just to get a understanding on what does what then the system is very user friendly. After 2 weeks of daily use it's been holding up great. Also I'm in hot, humid climate, zero issues. 1- Plug and play. I had the factory business cd player and it was all plug and play for me. I talked to a few guys that had aftermarket double din units and they all said it's plug and play also. 2- if you're a android user this will feel very much at home to you because it is powered by android so the menus feel right when swiping back and forth. 3- GOOD NEWS! (James May voice) for those with Harmon Kardon speakers. This compliments the speakers very well. My speakers are louder than ever with this unit. No joke, if I'm just sitting in my car volume 1 is loud enough. When driving at highway speeds with the windows down you won't have any trouble hearing your music. 4- CONNECTIVITY. If you're trying to connect anything i.e Bluetooth, hotspot etc. It's a very quick process. I don't usr a stopwatch to time how long. But if I'm trying to listen to my music from my phone using Bluetooth it only takes under 10 seconds for both devices to pair. Same with my hotspot. 5- GPS. The GPS is very good and instantly knows your location. None of that waiting while it's locating your position. Gps apps remember the map when not connected. What I mean. If I don't want to connect my hotspot but want to use my GPS in town I can with no problem because it knows my area after using it before. I use waze also and driving my daily route to work offline multiple times without any connection and had zero issues because it knows my area, also it still gives live speed readings while not connected. 7-Xtrons. I placed my order on a Friday. I received it the following Monday over a holiday weekend, from Hong Kong. So that was impressive to me. Their customer service is great. I contacted them through email when I had a issue( blonde moment during instal) and they responded by email within 15 minutes. Which I give them major kudos for that. 1) The unit doesn't come with SD cards. Really isn't a issue for me, I don't have any in and I don't have a problems. 2) Doesn't come with instructions. - not really a issue, everything is self explanatory. 3) The snap plug that connects the factory harness to the radio is a PITA. I broke the sliding locking bracket. Some other people had this issue as well. 4) it comes with to much. Now this is a personal opinion. I honestly don't need wires to set up a back up camera, or to set up a option to watch tv. That's to much stuff for me. I use the unit solely as a radio and gps. FOR THOSE WHO ARE NOT FAMILIAR WITH CAR AUDIO!! If this is to complicated for you then have a audio place so it for you for free. Yes free, Its literally a 30 second job. UPDATE! For those who live in hot climate. So I live in south Georgia and the summer temp and humidity are a factor. For me it's normally 98+ degrees with +90% humidity. If you let your vehicle sit in the sun all day don't be surprised if your radio does stuff on its on, like it's controlling itself, or touching itself(haha) this is because your touch screen is pretty hot and touch screens work by heat. Don't freak out and think your unit is broke. Please stop sending me messages such as how to make the factory nav stuff work. I dont have factory nav so I could care less about it. Read through the thread and you'll see others that have factory nav have covered it plenty of times. Finally please use common sense. Last edited by 11b4; Sun, Jul-09-2017 at 10:53:35 PM. Reason: New update. Gegreed, thank you for posting this. Seems like finally there is one of these I could use without wanting to rip it out and defecate onto it mid drive. If they could get rid of the giant fisher price buttons, I'd buy one. My immediate reaction to the gui was how awful it looks in the E46. Honestly I like the buttons. When I'm driving I'm not constantly looking at the radio. Which makes it easier to find when eyes are down the road and fingers are feeling around. Excellent review, I just did one for the same unit for E39 and had similar conclusions. The unit is generally excellent , far exceeding expectations. Can you post detail on how you connected the steering wheel ibus controls ? I couldn't figure it out and either could the stereo shop I took it to. Ive posted on the xtrons forum with no luck - my post has been sitting in "pending approval" for a few days. We tried to connect the controls to the KEY and GND wires and we got some of the functions to register, but they were delayed as much as 15 seconds. For example, we press volume+ and 15 seconds later it registers on the unit. This is great! More interest in the audio portion of our cars. I must have have a hand made Eonon unit as I haven't​ had any issues other than lack of app space. I working on this though. All times are GMT. The time now is 06:23:49 AM.